As Director of Organizational Development, John is responsible for facility design and maintenance and employee well-being. John works closely with the staff to help them develop as individuals and professionals, and has a passion for continuous improvement. He holds a PhD in Engineering and is currently enrolled in a Master's program for robotics. "Our staff is the best there is in terms of professionalism, capability and personality," says John. "It's great to just be at the hospital and see the teamwork. I'm proud to be a staff member." At home, John has a fish, Wanda, who is over 20 years old. He enjoys auto restoration, home restoration, ship building, and fitness. As our practice manager since September 2014, Lisa's responsibilities include overseeing the daily operations of the hospital and maintaining positive relationships with team members, clients and referring veterinarians. 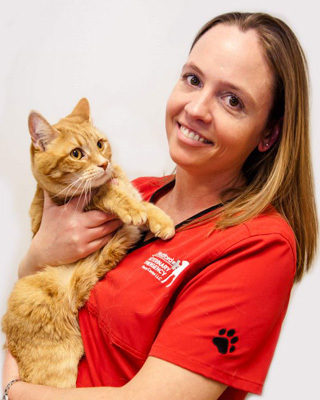 Lisa earned her Bachelor's degree in Veterinary Technology from Becker College and is a certified veterinary technician. With her thorough understanding of the veterinary industry, she is committed to ensuring we offer exceptional client service and patient care. "Westford Veterinary Emergency and Referral Center is a growing organization which values the opinions and suggestions of its team members," she says. "We consistently strive to offer top-notch client service and patient care, and search for methods to improve the business." Lisa has four cats: Cliffy, Tippy, Kayla and Mary Ellen. She enjoys hiking, fishing, camping, watching her son play sports and spending time with family and friends. Alissa is a down-to-earth and compassionate veterinary nurse who has been skillfully caring for patients at Westford Veterinary Emergency and Referral Center since October 2014. Her responsibilities include triage, monitoring patients during surgery and critical care. Alissa earned her Bachelor's degree from the University of Massachusetts Lowell. "I enjoy the high energy and excitement of emergency medicine, never knowing what can walk through the door next," she says. "I also enjoy working with a staff that's just as like-minded in the quality of medicine and personal care given to every animal that comes in for treatment. I am continuously challenged and encouraged to learn more every day from both my fellow technicians and the incredible doctors and management I work with." Outside work, Alissa enjoys working on her family farm, riding horses, hiking and other outdoor activities. She has a Staffordshire terrier named Ziva, a Quarterhorse named Indy, a Miniature Pinto named Java and a barn cat named Sawyer as well as hens, cows and occasionally goats. Allison joined us as our full-time veterinary technician in December 2017. 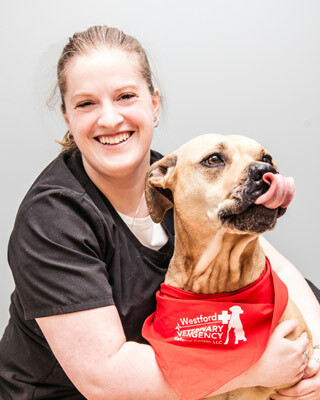 At Westford Veterinary, Allison works with our veterinarians, monitors patients, provides educational information for our clients, and administers treatments for our furry patients. She has an Associate’s Degree in Veterinary Technology, another Associate’s Degree in Animal Care, and a Bachelor’s Degree in Veterinary Science. Allison has a German short-haired Pointer puppy named Denim who’s only 7 months old. In her free time, she enjoys hiking, camping, and traveling. Ally joined the medical team at Westford Veterinary Emergency and Referral Center in May 2017. Some of her daily responsibilities include providing nursing care, patient stabilization and triage. Ally loves exotic animals, and she enjoys cuddling patients and seeing critical patients recover and go home. Prior to joining our hospital, she earned her Bachelor of Science degree in Veterinary Technology from Mount Ida College. Ally is currently working towards her veterinary technician certification. “I completed an internship with Westford Veterinary Emergency and Referral Center and I fell in love with the hospital and staff,” Ally says. At home, Ally has an 8-year-old domestic shorthair cat named Rusty and a 5-year-old domestic shorthair cat named Twitch. In her free time, she enjoys mixed martial arts, boxing, hiking, being outside, swimming, and working as a counselor for Girl Scouts of America. Amy is our veterinary technician who joined our team in September 2018. Her positive, upbeat attitude and compassion combined with her 6-years experience in the animal field makes her a great fit for our staff. She has an Associate's Degree in Life Science and thoroughly enjoys helping our clients become stronger and healthier. "I never know what my day will look like and enjoy the unpredictable, fast pace of the office. I enjoy helping sick and injured pets of all species," Amy says. At home, Amy's place is filled with loving pets! She has a nine-year-old Staffordshire mix named Cocoa, four cats – Shadow, a one-year-old domestic long-haired; Milo, a nine-year-old domestic long-haired; Simbra, a 10-yer-old domestic short-haired; Princess, a 16-year-old domestic-long haired – a blue-tongued skink named Little Foot, a ball python named Baelfire, a King snake named Noodle, two tarantulas, a turtle, a scorpion, and a Sugar Glider named Rocky. What a full house! In her spare time, Amy enjoys hiking, fishing, traveling, and zoo-hopping. Full-time team member and Veterinary Technician Angela has been working in the animal related field for over 12 years, and came to Westford Veterinary Emergency Referral Center in January of 2017. She is a Certified Veterinary Technician, licensed in New Hampshire and Delaware, and is a vital piece of our incomparable workforce. Currently enrolled at Southern New Hampshire University, Angela likes to keep her brain active and stimulated. She is extremely passionate about emergency and critical care, and hopes to pursue such fields in her professional future. At home, Angela enjoys spending her down-time outdoors, as she loves the sun and being outside. Some of her hobbies include hiking, swimming, running, biking, and working at the horse farm. One of her favorite places to be is at the gym, where she trains in Brazilian Jiu Jitsu for as many hours as she can during the week. Angela has a variety of pets, including an American Saddlebred horse named Patrick, who she has had since she was 2 years old, Tyson, a rescued Pitbull, a chinchilla named Chinchy, a beta fish named Harold, and 4 cats named Chopper, Louie, O’Malley, and Stanley. 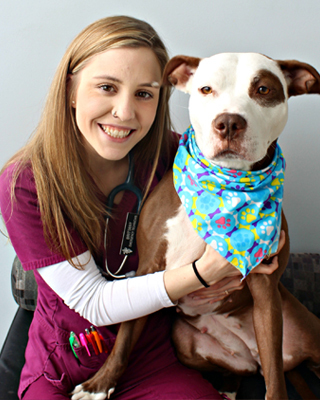 Brittany is a full-time veterinary technician at Westford Veterinary Emergency & Referral Center. She graduated from Becker College in 2015 with a bachelor’s degree in Veterinary Science. Some of her daily responsibilities include admitting patients, comforting clients, administering medications, and running lab work. Brittany enjoys the fast-paced environment of the hospital and the broad spectrum of cases they encounter. Brittany enjoys working with all type of animals, including pocket pets! At home, Brittany cares for her Pitbull Mookie, and four ferrets named Nimbus, Flower, Duke, and Sirius. She enjoys hiking with her dog, going to concerts, and playing field hockey in her spare time. 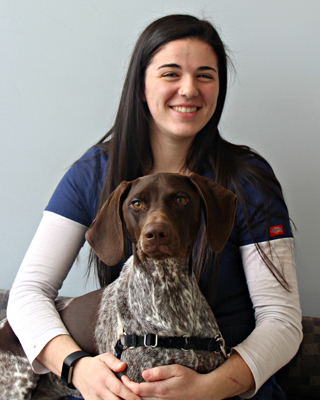 Brittany R. is a full-time Certified Veterinary Technician at our Westford Veterinary Emergency & Referral Center. She is responsible for triage, venipuncture, IV catheter placement, running in-house labs, client communication, radiology, and patient monitoring. Brittany has a Bachelors of Science degree in Veterinary Technology from Mount Ida College. 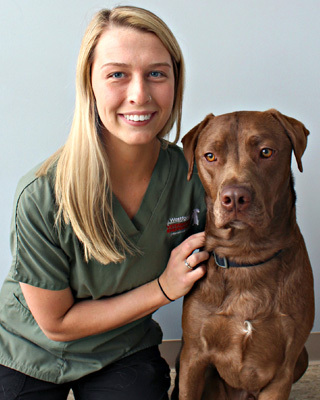 She has been with the Westford Veterinary team since April, 2019. Brittany has been caring for animals since age 18, when she worked as an animal care specialist and kennel technician. She also worked as a veterinary assistant throughout college. During her senior year, she completed six small animal rotations as a veterinary technician. Brittany has a 5 year old Hound mix named Mable, who she loves playing with during her free time. She also loves hiking and going to the beach. We are so lucky to have Brittany as part of the Westford family! 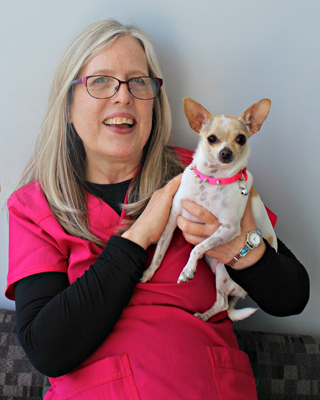 As a veterinary technician, Dianne's responsibilities include taking vital signs and medical history, placing IV catheters and collecting blood and urine samples, completing in-house laboratory tests and taking radiographs. She is excellent and experienced at both comforting our patients and empathizing with their owners. 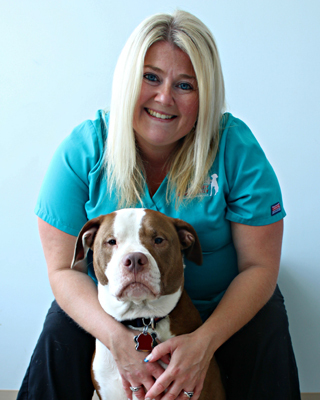 Dianne earned her Associate's degree in veterinary technology from Newbury College and joined our team in 2012. She recently became a grandma to Luna, a beagle mix. Melanie joined the Westford Veterinary Emergency and Referral Center in July 2016. 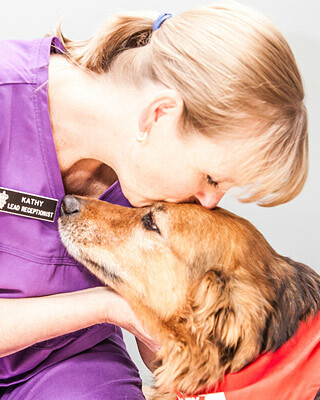 Her responsibilities as an Emergency Veterinary Technician include assisting the veterinarians with the medical care of hospitalized patients, patient advocate and filling in as temporary cuddle buddy for pets when owner can't be there. Providing comfort to patients and assuring they are treated well are what she enjoys most in her role at the hospital. "I enjoy working with the great team members at Westford," Melanie says. "Everyone is so friendly and compassionate." She has a bachelor's of science and has been employed in an animal related field for four years. In her free time, Melanie enjoys reading, hiking and spending time with her dog. Meridythe joined the Westford Veterinary Emergency and Referral Center team in October 2016. As an emergency veterinary technician, her duties include the triage of patients, performing outpatient procedures and running blood tests. She graduated from the University of New Hampshire in 2005 with a bachelor degree in business administration and earned a bachelor degree in science from Mount Ida College in the fall of 2016. Meridythe has worked in an animal-related field for four years, including as a volunteer for a greyhound adoption center. "The staff has a strong work ethic and knowledge in regards to veterinary medicine, and work as a team in order to care for clients and their pets," she says. When not working, Meridythe enjoys going for walks and hikes with her dog, Andiamo, a 3-year-old terrier mix adopted from Tennessee. She also likes reading mystery novels, watching Red Sox, Bruins and New England Patriot games, as well as spending time with friends and family. Miranda helps prioritize patients’ treatment plans, monitors blood transfusions, and assists in emergency and critical care. Miranda is passionate about being an advocate for her patients, since she is their voice when they are in the hospital. Miranda is a vital problem-solver on our team and always makes sure to put the patients’ comfort first during treatments. She has an associate degree of Applied Science in Veterinary Technology from The Vet Tech Institute at Bradford and has been involved in animal related fields since 2012. She enjoys working in an ER environment because every day is an adventure to help animals feel better. Miranda and her husband enjoy taking their dogs to the park, cooking and exploring the town. They are expecting their first child together in February of 2019. Miriam joined the team at Westford Veterinary Emergency and Referral Center in October 2016. As an emergency veterinary technician, she is responsible for monitoring anesthesia, placing IV catheters, obtaining samples, triaging patients and communicating with and comforting clients. She provides exceptional nursing care to patients by communicating directly with the veterinarian to ensure that all patients receive accurate treatment to help with pain and healing. "The most rewarding part of my job is being able to provide pain relief and help a patient recover from whatever ailment they may have," Miriam says. 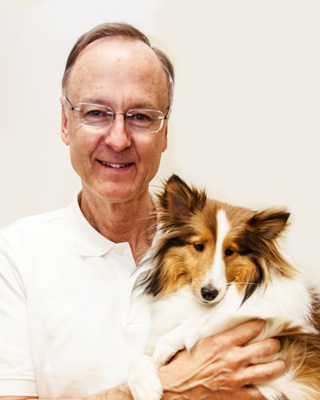 "I am happiest when I am able to discharge a patient back to their owner with an expectation of a full recovery." Miriam holds an Associate degree in Veterinary Science from Becker College, and has experience handling a wide variety of exotic, domestic and farm animals. 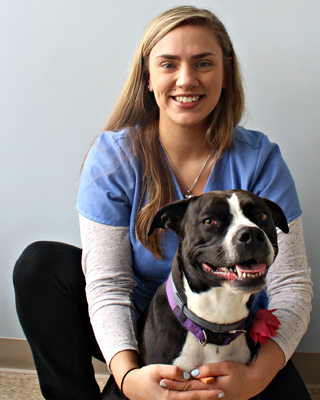 She is currently licensed with the Massachusetts Veterinary Technician Association, and is a Certified Veterinary CPR instruction with Basic Animal Rescue Training. At home, Miriam has a 5-year-old domestic shorthair cat named Sir Sebastian Von Haddock, a 5-year-old terrier-mix named Layla and a 30-year-old quarter horse named Lizzy. She enjoys walking and hiking with her dog, riding her horse for pleasure, and cuddling with her cat. Outside of the hospital, Miriam spend her free time swimming, boating, tubing, jet-skiing, four-wheeling, going on nature walks, relaxing on the beach, dancing, antiquing and fishing. With more than three decades of experience in an animal related field, Robin joined our team in October 2012. "The people are great to work with and there is always something to learn," she says. 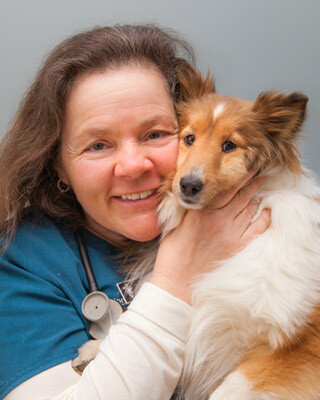 Robin holds a Bachelor's degree in Biological Science from the University of Massachusetts at Lowell and has spent years working in both a general and emergency veterinary practice. With her excellent organizational skills, she is in charge of monitoring hospital inventory. Her responsibilities also include caring for our patients, whether in- or outpatient. Cassie is a full-time Veterinary Technician here at Westford Veterinary Emergency & Referral Center LLC She is an essential member of our team who provides excellent nursing care for the internal medicine department, prioritizes client education, maintains accurate medical records, and assists in procedures. Cassandra brings her love of animals and her excellent knowledge of medical care to our hospital and we are so grateful for her! She is currently enrolled at Middlesex Community College, pursuing a degree in Business Administration. 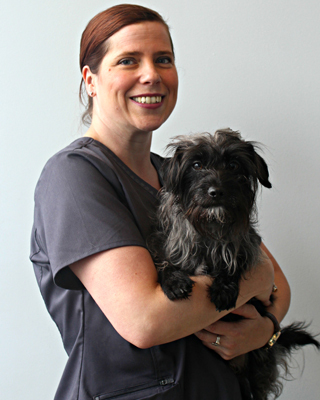 Cassie has been working with animals for several years in the areas of general practice, surgery, dermatology, emergency and physical therapy. Cassandra loves working in specialty medicine is exciting because every day is different, fast paced and gives you an opportunity to constantly learn and grow. She has three pets: Georgie and Peppa, her two Guinea Pigs, and Dusty, her Yorkie Poo mix. In her free time, Cassandra loves to cook, read, watch movies, watch the Patriots and Bruins, attend concerts, hike, and spend time with her family and friends. A natural team player and problem solver, Christine has been a part of the Westford Veterinary Emergency and Referral Center team "since day one" in November 2012. Christine is in charge of the day-to-day running of our specialty departments and ensuring strong communication between all of our departments. She is also our Lowell Humane Society and NEADS program hospital liaison. With an Associate's degree in Animal Science from Mount Ida College, she boasts 16 years of experience in an animal related field. 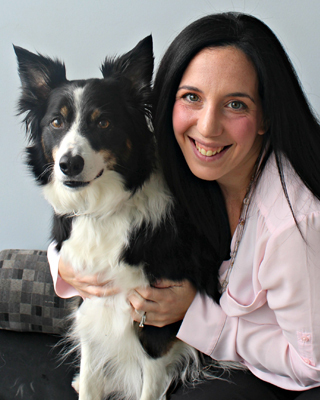 "I really enjoy meeting our clients and their beloved pets," she says. "I love hearing their stories and seeing the bond between them." Christine volunteers her free time with ACE (Animal Care and Education) of Central Massachusetts, a non-profit organization dedicated to the care of animals in need and the education of school children and their families on pet care responsibility. Outside work, Christine is also a licensed horseback riding instructor and former member of the Mount Ida Equestrian Team. These days, she enjoys trail riding just for fun. She also enjoys hiking, reading, cooking on the grill, and being kept busy by her two sons, Owen and Myles. Christine and her family have two dogs, a Puggle, Suzie, and a Chihuahua, Hershey; two cats, Angel and Simmy; and a beta fish, Squidward Tentacles. Jerri joined Westford Veterinary Emergency and Referral Center in January 2017, and has worked in the animal-care field for over 10 years. As a veterinary technician, she assists with ultrasounds, CT scans, oncology treatments, radiographs, internal medicine appointments, blood draws and lab work. Jerri earned her Bachelor of Science degree in Veterinary Technology from Mt. Ida College in 2006. At home, Jerri has a 3-year-old lab mix named Dublin, two 3-year-old lab/boxer mixes named Maddie and Sully, and a lovebird named Grady. She enjoys spending her free time with her son Caydin, family and friends. Jerri is an assistant coach on Caydin’s baseball team. She also enjoys photography, camping and going to the beach. Lyndsey Holston is our veterinary technician assistant who joined our team in August of 2017. 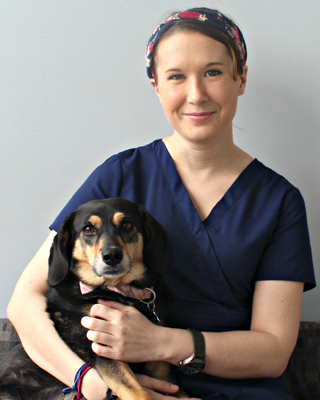 Here at our office, Lyndsey assists our doctors and technicians with internal medicine appointments for your pets. This includes getting patient history, assisting with ultra sounds, CT scans, and performing laboratory diagnostic tests. “I really enjoy communicating with clients and getting the opportunity to know their pet’s history in order to help the doctor form a treatment plan and bring their cherished companion back to their normal, happy selves,” she says. With a positive attitude and a drive to educate herself further, Lyndsey is excited to work with our staff to help improve your pets’ lives. In her spare time, Lyndsey enjoys spending time outdoors, going on hikes, going on walks, and visiting the beach with her four-year-old black Labrador retriever, Ryley. She also likes long car rides, cooking, and spending time with family and friends. 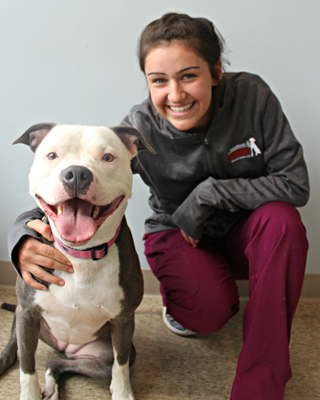 Adriana is a full-time Veterinary Technician Assistant at Westford Veterinary Emergency & Referral Center. Some of Adriana’s responsibilities include assisting in patient care, cleaning, and stocking of supplies in the hospital. She loves having the opportunity to work closely with the technicians and doctors on emergency cases. Her upbeat, positive attitude is helpful to patients and staff during high-stress situations. Adriana has two dogs, Zoey (Pitbull) and Baloo (German Sheppard/Boarder Collie mix), and a cat named Ashes. In her spare time, Adriana enjoys hiking with her dogs and shopping at flea markets. Brenna was welcomed to the WVERC in June of 2018 as a part time Emergency Veterinary Technician Assistant. When she is not working at our facility, Brenna is pursuing her education at UMass Amherst. Through ger program of studies, Brenna works with Hadley Farm, and also works at a doggy daycare. At home, Brenna has one cat. She enjoys passing her free-time by spending it with friends, family, and loved ones. Lauren helps the team by assisting doctors and technicians, running lab work, patient restraint and monitoring during procedures, preparing surgical equipment and various cleaning duties. 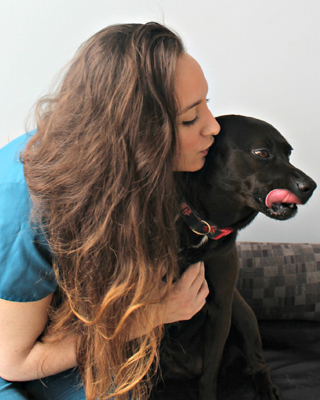 Our team loves that she has extensive experience in canine behavior. Bachelor’s in Russian Language from Mount Holyoke College and soon she will be going to school for an associate degree in veterinary technology. She enjoys constantly learning on the job and getting to know the patients. Lauren has been employed in animal-related fields since 2012! When she isn’t at work, she is caring for her dogs Valkyrie and Finley. 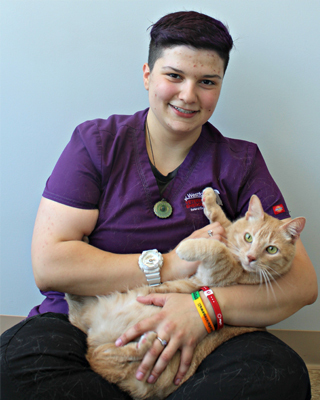 Vanessa is a compassionate and understanding emergency veterinary technician assistant who joined the Westford Veterinary Emergency and Referral Center in November 2014. Her responsibilities include assisting veterinarians during procedures and helping the hospital's patients receive the best care possible . "I enjoy working in this veterinary hospital because of my wonderful coworkers, amazing clientele and the variety of animals I see from day to day," she says. "Emergency clinics have a different type of atmosphere, but our team is outstanding when it comes to putting the clients and their pets first." Outside work, Vanessa likes to spend her time with her family, visiting her mom in Hawaii and going on adventures with her boyfriend. Patience and understanding are two unique attributes that Amy brings to Westford Veterinary Emergency & Referral Center LLC as one of our wonderful Client Service Representatives. Amy loves to work closely with our clients to insure the best health of their pets, and provides her assistance with check-ins, answering phones, keeping up with medical records, and much more. Amy possesses an associate degree in Animal Science and has been working in the animal related field for over 7 years. She has worked for numerous animal care providers and has helped many people and their pets optimize their time together. As a huge reptile enthusiast, Amy loves working with specialized cases and needs of reptiles. She has a Bearded Dragon of her own named Nubs. Amy also owns two DSH cats named Kira and Kaido, a Chihuahua named Gunner, and a Shih Tzu named Silky. When the weather is warmer Amy likes to go to yard sales and flea markets. She also is a passionate gamer who can usually be found playing something in her spare time. Helene Forney is a full-time Client Service Representative here at Westford Veterinary Emergency & Referral Center LLC. She is responsible for greeting clients, answering the phones, offering quality customer service, entering records, and keeping the front look clean and neat. She always offers a friendly smile to all our patients and we adore her positivity! Helene loves interacting with the clients and their pets. One of the highlights of her job is being able to be one of the first people to greet patients and comfort them while their pets are getting the care they need. Her compassion is what makes her such an excellent member of the Westford family. Helene has been working with us since November of 2018. She has a degree in Biology with a concentration in Zoology and a minor in Psychology from Palm Beach Atlantic University. Helene has a black cat named Pascal, and she pet sits for friends and family. In her free time, she is a youth leader for girls at her church. She also loves to go to the movies, reading, hanging out with friends, and trying new food. We are so lucky to have her as part of the team, and Westford is lucky to have her! 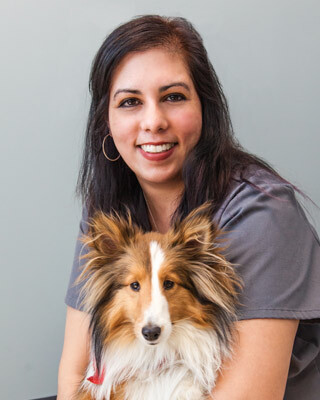 Working as one of our full time Client Service Representatives, India shows a positive and outgoing personality and attitude each day she comes in to Westford Veterinary Emergency Referral Center. Since joining our team in August of 2018 India has been working hard to uphold our high standards of customer service and interaction. She handles medical records maintenance, helps answer phones, provides client education, assists with hospital upkeep and cleanliness, and assists with client check ins and follow-ups. Outside of the hospital, India attends school for Medical Assisting at Quinsigamond Community College. At home she has eight pets. India has four dogs, named Deli, Snowbie, Yogi, and Dakota. She also has two bunnies, named Fawn and Beans, as well as two fish named Jack and Eleanor. Karla plays a key role in our Client Service Representative staff here at Westford Veterinary Emergency & Referral Center LLC, working to assess the severity of injury or illness in order to call for the right triage code for incoming patients. Karla is also responsible for answering client phone calls, assisting staff, and various other receptionist duties. One of her favorite aspects of the job is checking a patient out and knowing that they are going home healthy with our clients. Karla brings over 15 years of experience to her position, and possesses Spanish-speaking capabilities. Karla loves the summer time, and enjoys spending much of her free time outside. She loves to garden, growing her own vegetables during the summer months. Karla is not only a wonderful receptionist, but she is also a certified Zumba instructor. However, that’s not all as she also owns her own clothing boutique. At home, Karla owns a German Sheppard named Diezal, two cats named Lion “O” and Tails, along with two parrots named Nikita and Ollie. Kathy joined our team in May 2013 and is responsible for supervising the reception staff and overseeing accounts receivable. In her role, she can successfully combine her love and compassion for animals, her years of client communication experience and her knowledge of accounting. "I love working for an exceptional management team that constantly shows their appreciation to the staff," she says. "It's a pleasure to work in an environment where we are able to medically treat such a variety of animals and see the happy reunion when they can go home." Kathy has two mixed breed dogs, Rexey and Lilly, and three cats, Smokey, Snickers and Molly. She enjoys yard sales, flea markets, open houses, walks with her dogs and spending time with family and friends. 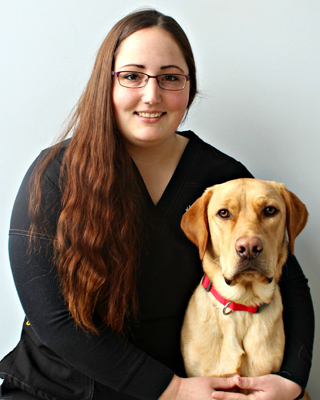 Natalie is a full-time Client Service Representative here at Westford Veterinary Emergency & Referral Center LLC. She is an essential part of keeping our operations running smoothly. Her responsibilities include answering phones, assisting clients’ needs, updating client and patient database, preparing and maintaining medical records, efficiently admit and check out clients, process payments and financial transactions, manage computer operations, filing and office functions, and ensuring every client to feels they’re in great hands. Natalie brings an infectious positivity to our office, and she always makes every day a little brighter. She is currently pursuing a degree in Psychology. Natalie has been with our team since December of 2018, and has 8 years of experience working with animals. She has an American Staffordshire terrier named Capone, who is 7 years old, and a black kitty named Boswell, who is 16 years old. Natalie loves riding horses, hiking, walking her dog, writing, reading, boating, and fishing. We are so happy to have her as part of the Westford team! Sarah Jane is the first person you will see at our office. Communicating with clients, answering phones, keeping lobby presentable, administrative tasks and filling the dog cookie bowl. She has a Bachelor of Science in Animal Biology from UC Davis. Sarah has many pets, including two cats named Annabelle and Caboose, a leopard gecko named Moe, a cornsnake named Jeter, nine fish named Donnie, Debbie, Darwin, Phil, Spike, Dil, Angelica, Appa and Boxy, a rose hair tarantula named Athenia and two snails named Reptar and Gary. Sarah loves seeing patients recover back to their happy, healthy selves. In her spare time, you can find her hiking, baking, shopping at used bookstores, and watching the Hallmark Channel or the Yankees. Sarah is our full-time Hospital Relations Coordinator that joined our team in April of 2018. Her responsibilities include promotion through social media and local events, as well as creating strong relationships with local DVMs and pet-related businesses. Her 8-year history working in the animal related field allows her to work efficiently and flawlessly at WVERC. At home, Sarah has a Tri-Colored Border Collie named Maya, who is 11-years-young. Sarah loves spending her free time with family and friends, no matter if it's a casual setting or an event. One of the great joys in Sarah’s life is seeing her daughter share the same passion for animals as she does. Sarah also enjoys taking photos and watching her favorite hockey team, the Boston Bruins.